Cuchifritos presents “Up as if Down”, an exhibition of works by Shara Hughes, Peter Kreider and Moises Saman, which question common conceptions of “reality” as well as what we – individually and collectively – are willing to accept as “real”. The neurologist and author Oliver Sacks has written about seminal case studies of psychophysics that demonstrate the human ability to adjust to radically distorted sensory information regarding one’s environment. With the aid of special inverting lenses, which make everything appear upside down, subjects who wore these goggles continuously over a period of days and weeks learned to walk naturally, read and write, even ride a bicycle. Their brains quickly and compliantly adapted to accept the inverted world as the “new normal”. “Up as if Down” in this case refers to the wide range of visual information, whether factual, fictional, or some variation of the two, which informs and constructs our picture of the world. 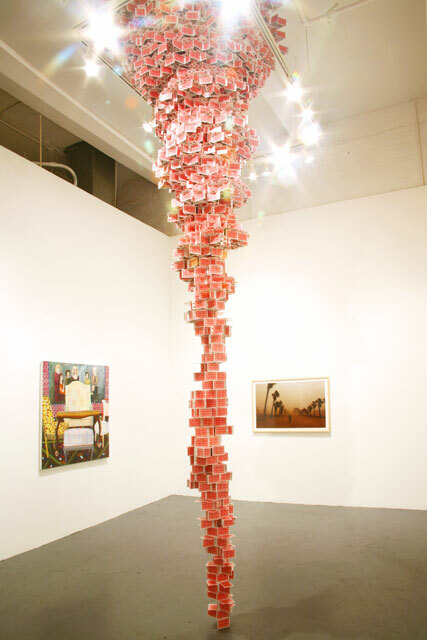 Peter Kreider’s “House Tornado”, 2007, is a 12-foot-tall house of playing cards turned on its head, rising from floor to ceiling. This sculpture depends entirely on the viewer’s suspension of disbelief. In general, the mind is willing to accept whatever is presented to it, regardless of intuition, logic or the laws of physics while simultaneously understanding that it is a fabrication. Kreider’s work embodies the impulse to amass material in order to render visible the invisible. The act of compiling ordinary tangible objects becomes evidence of an intangible force, in this case wind and energy. In contrast, photographs by Moises Saman taken recently in Iraq of senseless horror are unfortunately very real. Saman’s witness to the results of war express empathy and humanity during the ongoing bloodshed and conflict. In “Dust Storm in Baghdad” (2003), Saman shows a boy alone in the bombed city moving away from the viewer along a long avenue lined with palm trees. This lone child is carrying an automatic weapon that is almost as tall as he is. The disjunctive pairing of seeming innocence and malevolence parallels not only our own ability to become habituated to the incongruity of such images, but also the human capacity to accept such intolerable states of brutality and violence as ordinary facts of life. A new painting by Shara Hughes crosses representation of imagined spaces with pictorial references to various periods in art history. In “Family Portrait”, 2007, Hughes creates a space that feels familiar but has never actually existed. Her depiction of an intimate interior includes a fabricated family portrait that recalls 15th-century European Renaissance group portraits. Hughes’ painting-within-a-painting combines the tradition – in art, literature and everyday life – of calibrating one’s own personal history in a favorable and more flattering way. The family members in Hughe’s work are presented as powerful and beautiful, combined with 1980s styled “family” shots of a hip, glum art community orchestrated in a manner that is similarly far from “real”. Shara Hughes currently has a one-person exhibition at Parts Gallery, Toronto, Canada and has an upcoming exhibition at Museum 52, London England. Hughes received her BFA from Rhode Island School of Design in 2004 and is represented by Rivington Arms, New York. Peter Kreider is currently in a two-person exhibition at Reed College, Portland, Oregon as part of part of Portland Institute of Contemporary Art’s TBA Festival, through December 31, 2007 with a catalogue with texts by Stephanie Snyder and Kristan Kennedy. His work has been seen in New York at Jack the Pelican Presents, 2007, Public Art Fund, 2005 and White Columns, 2004. Kreider received his MFA from Tyler School of Art/Temple University in 2004. Moises Saman has published “This is War: A Witness to Man Destruction” and a collaboration with historian Howard Zinn “The Just War”. His newest book, “Afghanistan: Broken Promise”, will be released in the United States in November, 2007, all books published by Edizioni Charta. Milan, Italy. Saman’s work from Afghanistan received a 3rd prize on the Daily Life Story category in the 2007 World Press Photo contest and an Honorable Mention in the UNICEF Photo of the Year awards. In 2007 Saman also received a World Press Photo award for his coverage of the presidential elections in Haiti, as well as being named Photographer of the Year by the New York Press Photographers Association. Special thanks to Rivington Arms, New York, Roebling Hall, New York, James Trainor and Peter Ryan. This exhibit is sponsored, in part, by public funds from the New York City Department of Cultural Affairs and through the generous support of the following: The New York City Economic Development Corporation, The Greenwall Foundation, Foundation for Contemporary Arts, and the members of the Artists Alliance Incorporated.